Yes, the book is highly entertaining. But what the enigmatic professor (is he really a professor and is his name actually Solomon?) has achieved is to give us a work that is, for the most part, completely neutral and always very informative. Not only do we have the “true” stories of inner earth exploration and the wondrous things purportedly found there, we are also treated to the history surrounding the characters and events. All this makes for fascinating and, quite frankly, bewildering reading. Not bewildering in the sense that the book itself is confusing, because it isn’t. Solomon’s writing is clear, precise and readable. What bewildered me was the way people are both self-deluded (the inner earth explorers themselves) and gullible (their followers, fans and readers). The stories are told in chronological order, beginning with Celtic and Greek myth (or is it truth?) and move through history to the modern day. There are stories of kings and sea captains, of fairies and ethereal cities filled with beings of a much higher order than ourselves, and of course the men and women who discovered the entrances to these worlds within our world and found themselves guests, or prisoners, of these subterranean civilisations. One of the most interesting stories is of the claims made by an American named Richard Shaver in the years preceding World War II. His journey to the inner earth uncovered the Lemurian civilisation, built by the survivors of the lost city of Atlantis. As fascinating as this inner earth tale might be, more intriguing still was Shaver’s relationship with Ray Palmer, the founder of Amazing Stories, the world’s first true science fiction magazine. The Shaver connection and regular inclusion of Shaver’s “true” adventures in the inner earth was a feature of Amazing Stories for many years. Did Palmer believe Shaver or was it simply a good way to sell his magazine? Who knows, but it does offer a fascinating insight into the constant pressure on the media to sell its wares and stay in the public consciousness by any means available. So what does await the intrepid explorer and seeker after truth beneath the earth’s crust? The accounts are remarkably similar. There is light, either from some sort of small sun or from a glow inherent in the rocks themselves. There are trees and cities and people, many of whom are either capable of magic or possessing artefacts that are almost magical in their function. But there is an interesting divergence. The ancient accounts are full of magic and bargains and prohibitions. The inner earth is a place of trickery, an untrustworthy faerieland whose inhabitants are masters of lies and deception. Orpheus is a classical example: he descends to the underworld to rescue his wife, but her escape is subject to a bargain, one that the rulers of inner earth had no intention of keeping. From the 19th Century onwards, however, the inner earth becomes the location of utopia, a beautiful realm inhabited by superior beings dressed in Grecian robes and endlessly declaring about how the surface dwellers need to learn the way of peace and brotherhood, oneness with the universe and so on. They all talk in a sort of formal, Hollywood-Ancients style punctuated with sentences such as “You are welcome to our world.” and “Come, you will be shown wonders”. In some cases their saintliness has teeth, in the form of some ultra-powerful weapon with which they will defend themselves should us barbarians from the surface ever try it on with them. The book ends with a set of intriguing appendices including Professor Soloman’s own guide to visiting the inner earth, and an interesting piece on found manuscripts which ends with some delightful mischief from the author. With Visitors to the Inner Earth, you feel you are in the hands of a friend, someone who is keen to tell you a good story but who doesn’t judge the source, someone who is always fair and never intense, cynical, or mocking. And believe me; some of these inner-earth types are ripe for mockery and scorn! And there is some truth in the philosophy expressed by many a commentator in relation to some of these stories, that even if their wisdom and radical, wise and peace-loving philosophy isn’t actually received from a superior race living beneath our feet, it is a good and worthy philosophy all the same and perhaps we would do well to heed it. My thanks to Future Fire and Terry Grimwood for the review of my book. I have read many of the Professor's books, the range is fascinating and expansive. 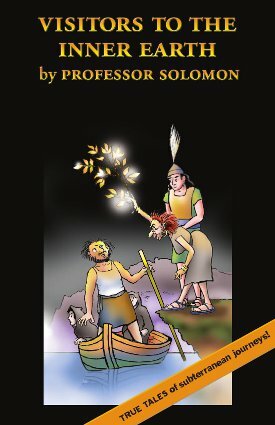 From his early days of monographs ("Letter on a Friend's Back) to his most useful (take your pick: "How To Find Lost Objects", "Japan in a Nutshell", or "Flying Saucer Travel Tips"), Professor Solomon comes through with exactly what he advertises: a sometimes rollicking, always entertaining, never disappointing good time! Bravo, Professor! And, to the uninitiated, this review is spot-on with it's understanding of the Professor.